That's a large reason why the media paints a different picture than real climate scientists—they're not accountable. Often, the reason for disbelieving in man-made global warming seem to be political rather than scientific. Eg - "it's all a liberal plot to spread socialism and destroy capitalism". As one person put it, "the cheerleaders for doing something about global warming seem to be largely the cheerleaders for many causes of which I disapprove". However, what is causing global warming is a purely scientific question. 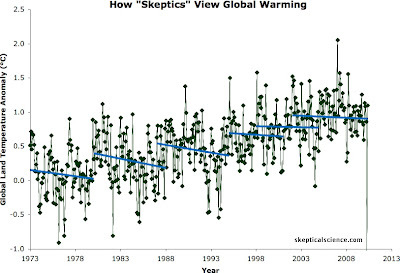 Skeptical Science removes the politics from the debate by concentrating solely on the science. There's considerable content on the site that uses hard science to reveal those opposed to meaningful action on climate change are not skeptics, but deniers—the opposition uses supposed scientific uncertainty as a cover for a political or mercenary reason. Update: Apparently the animated gif of the Skeptical Science web site won't animate in Blogger. (Why?) So I have pasted in the other ("skeptic") view of the same data. Click through to the original to see the animation.